Sam Allardyce is planning to sue the BBC after the allegations of corruption made against him on Panorama. Panorama secretly filmed agents claiming they had paid the Bolton boss bungs, though he has said he has never taken, asked for or received a bung. He also said he would not condone any breaches of Football Association rules. Allardyce said: "I have had lengthy discussions with my lawyers and I am planning to sue the BBC over the false and highly damaging allegations." He added: "My lawyers have advised me that I have a very strong case in relation to the programme. "I have therefore instructed my lawyers to prepare my case against the BBC." Allardyce's son Craig was filmed boasting about how he could get access to his father to do deals for Bolton, and was accused by the programme of receiving secret payments. Craig Allardyce has also since denied any wrongdoing, saying he was exaggerating his own importance to the undercover reporter in order to attract opportunities. Sam Allardyce added: "Obviously, I need to discuss this matter with my chairman, Phil Gartside, as well as my wife, before I take any final decision, since they both have an interest in this. "Once the decision has been taken, I will make a further announcement. "In the meantime, I will continue to concentrate on the job of managing Bolton Wanderers, which is my first priority." 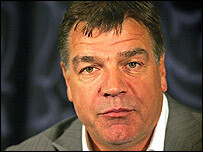 Talking last week, Allardyce insisted he had been the innocent victim of the "greed" of others on the programme. He said: "I am very angry at the lies told about me. The individuals who appeared in the programme making accusations against me have already confirmed in writing to my lawyers they lied to the BBC. "They lied in the hope of being able to make millions offered by the BBC reporter to buy their sports agency business. "Those individuals never thought their lies would be exposed in the way they have been and have apologised to me. "As a result of their greed, my good name has been tarnished by deceit and innuendo." "As a father, of course, it is painful to watch your son talk tall and exaggerate his influence for financial gain. "If there is any real evidence - and there won't be, as I am utterly innocent of any wrongdoing - I would expect the BBC to give that evidence to both the FA and the (Premier League's) Quest inquiry."